The 110 mile Cleveland Way was the second ever designated National Trail after the Pennine Way. This walk of two distinct halves begins in the attractive market town of Helmsley on the southern edge of the North York Moors. You will first follow sandstone escarpments, traverse wild heather moors and cross deep cut forested valleys, before leaving the hills for the coast at Saltburn. The second half of the route is a magnificent cliff-top coastal stride out, passing through pretty fishing villages, the picturesque home of Captain Cook, and a famous seaside resort before reaching journey's end at Filey. Walking the Cleveland Way in 7 stages is an option if you need to fit the walk within a single week. 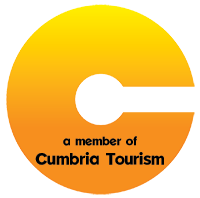 On this itinerary there are some long days and considerable accumulations of ascent and is only suitable for experienced walkers. Arrive at Helmsley and check in. Walking the Cleveland Way in 9 stages is our recommended option for anyone used to Long Distance Path walking. On this itinerary the daily stages are between 10 and 15 miles with daily accumulated ascent in the region of 2000 - 2500ft. 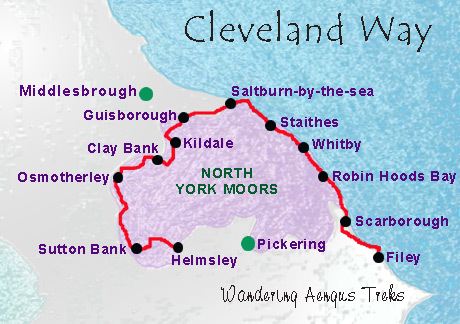 The Cleveland Way splits itself naturally into two halves. The western half is packed with interest as you traverse the boundary of the North Yorks Moor National Park and over the Hambleton and Cleveland Hills. This section has a wide variety of scenery from farmland, woodland, river valleys, sandstone edges, and wild open moors. Of historical interest along the way are Rievaulx Abbey, the White Horse of Kilburn and Captain Cook's memorial as well as the picturesque market towns of Helmsley and Osmotherly. The eastern half of the Cleveland way follows the coast from Saltburn to Filey. On this section you walk along cliff-tops, across secluded bays, through picturesque fishing villages, passing the Gothic ruins of Whitby Abbey, charming Robin Hoods Bay, and the famous seaside resort of Scarborough. Arrive at Saltburn-by-the-Sea and check in. HELMSLEY: There are buses to Helmsley from Pickering, Middlesborough, Thirsk and York (not every day). There are mainline train connections from York and Middlesborough. We are always happy to provide advice on the best way to get to the start of your holiday. SALTBURN (East Section): Saltburn has a railway station with connections to the mainline network via Middlesborough. RETURN from FILEY: There is a regular bus service between Filey and Scarborough, where there are train connections to the mainline rail network. The Cleveland Way is a reasonably challenging walk with a fair amount of ascent and descent. Over its approximately 110 miles, you will encounter a variety of underfoot conditions and will find yourself in some remote (and beautiful) locations. However, it is not all moors and cliff tops and there are stretches of woodland trails and interesting sights along the way such as the Norman abbeys of Rievalaulx and Whitby, the attractive fishing villages of Staithes and Robin Hoods Bay, and the seaside resorts of Saltburn, Scarborough and Filey.